Keep the meat and fish in their original packaging or in perfectly airtight bags, do not mix odors or flavors and avoid cross contamination. Place them in the lower part of the refrigerator, which is the coldest area, on the fruit and vegetable boxes, or in a special compartment that will maintain the correct storage temperature. Do not overload the refrigerator. To work and cool properly it is necessary to circulate the air. Only then the ideal general temperature of 5ºC will be stable. 2. Place the fruits on one side and the vegetables on the other in the drawers at the bottom of the refrigerator. Before placing them in the refrigerator, wash them and dry them. Put the loose pieces, without plastic bags, nets or cartons, and keep the fruit in one drawer and the vegetable in another so that they are always separated. In this way, the vegetable will stay fresh longer, because the fruit releases ethylene gas that can spoil it. The ideal storage temperature of fruits and vegetables is around 8ºC, so they should always be placed in the lowest area of ​​the refrigerator. 3. Keep the eggs in their original cardboard in the cold zone and the milk cartons in the refrigerator door. Although in most refrigerators there is a special compartment to store the eggs, they will stay fresh longer if you put them with their cardboard original. Keep in mind that any type of dish that you have prepared with fresh egg should be consumed within 24 hours, kept at a temperature of between 4 and 8 ° C -the low area of ​​the refrigerator- in airtight bottles. Store fresh dairy products, such as cheese and yogurt in cold areas of the refrigerator, at a temperature between 5 and 10ºC.Look to put in front of those who have a closer expiration date. The zone of the door of the refrigerator is the least cold, so you can place in it the briks of pasteurized milk. Preserves and prepared non-perishable foods can be stored in the pantry. When you have opened them and if there are any remains, you will have to place them inside the refrigerator to consume them in a maximum of 3 to 5 days. As for the cooked food and the leftovers you will have to place them in perfectly closed containers. Transparent packaging will help you better identify the content . Place them on the middle or upper shelves of the refrigerator; Never store a dish that is still hot in the refrigerator, to avoid altering the temperature inside the refrigerator. 5. Place frozen food in individual bags or sealed containers in the freezer. Label the frozen foods before introducing them, indicating date and content, preferably in individual sealed bags or containers; So you will only have to defrost as you need. Check the dates every so often to avoid expiration. Put on top what you are going to consume before and avoid wasting food. 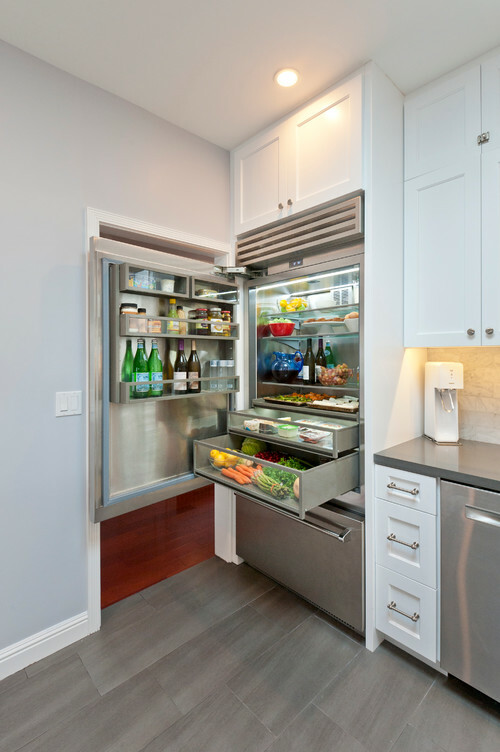 Use the top drawers to store the products you use often; in the lower ones, put those of more sporadic consumption.